A quick sketch that I did of my husband and boys a couple of weeks ago thinking of Father’s Day and today is Father’s Day so here I am posting it and wishing all the dad’s a Happy Father’s Day. Happy Father’s Day to my husband and my Dad, too. Nate Padavick and Salli Swindell started the blog “They Draw and Cook” a while back. There, illustrators submitted recipes that they felt like sharing. And although I hardly ever cook, I loved the idea of illustrating a Peruvian recipe so I picked my recipe immediately. Last week, I made time to start and finish the color illustration and type. Mainly because the deadline for submissions was October 10th. An interesting aspect of the project is that I tried to use Mochica iconography throughout the piece. The pre-Inca culture had one of the richest and most elaborate iconography of all of the Pre-Inca and Inca Civilizations. You may have read about the Lord of Sipan. If that’s the case, then you have seen the Mochica Civilization and the wonderful jewelry, pottery and iconography that they made. My mom’s side of the family came from Trujillo (province of La Libertad in Peru) one of the areas where the Mochicas flourished many, many years ago. Needless to say the piece has a lot of meaning to me and the research was a LOT of fun. UPDATE: And something I forgot to mention is that “They Draw and Cook” will be a book. There will be 100 recipes in the printed version. I’ll post something later once the book is ready so you can buy your copies. I certainly will. These last couple of months I’ve found a new direction to my work. I have looked back to my culture and ethnicity. With this I hope to bring a more meaningful body of work. There will be exploration, successes and failures. It’s how it should be and I’ll share as I explore. Now, this week’s Illustration Friday coincides with a piece I just finished – Llama Ride. I painted this personal piece for the Call to Hispanic/Latinos Multicultural PB Artists I posted yesterday. This post is an official call to other Hispanic/Latino Picture-Book Artists whose main focus of work is Multicultural Children’s Illustration. The initial idea was to find an existing group of Hispanic/Latino Children’s Illustrators to network with. Little did I know there was no such group. I looked online with no luck. I asked at Conferences and found the same answer – there’s no such thing. So why not get something started? I can’t be the only person who wants such a group. So here I am posting my call and I hope word gets out and we can get a nice group together. To create a critique group that understands our culture and so is better able to understand our multicultural illustration work from this perspective. To be able to network with talented, like-minded Hispanics and Latinos in our same field of work. To create a strong body of work that effectively represents the Hispanic and Latino culture with pride and respect. Group members post to our private blog when critique is needed. A reply in 24-48 hours is requested from the other members. Brief and sweet works best. Projects posted will be work-in-progress PBs so nondisclosure outside of the group is expected. What are your thoughts and ideas? What do you look for in a Critique Group like this one? I look forward to your comments. Multiple cows give multiple glasses of milk to multiple kids. 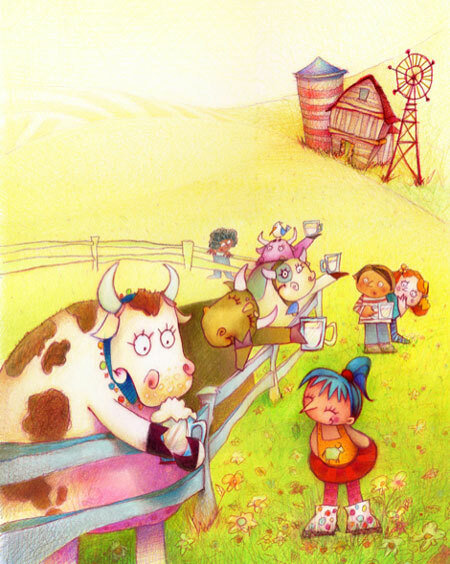 “La Vaca Lechera” – SRS/McGraw Hill.